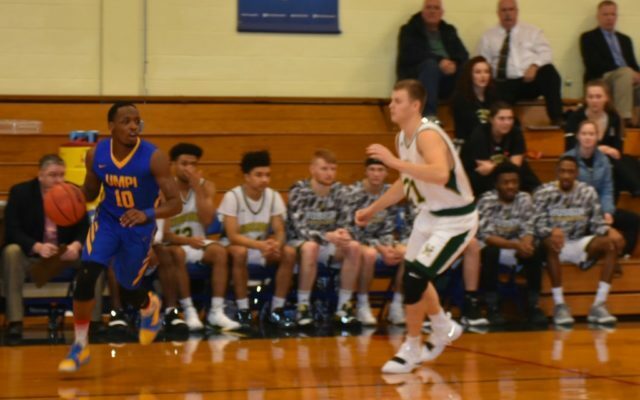 The UMPI basketball teams hope to halt losing streaks when they make the trip this weekend to take on Northern Vermont-Johnson for two games in Johnson, Vermont. The squads play Friday, with games at 5:30 and 7:30 p.m., and again Saturday, with tip times at 1 and 3 p.m. The men play first and the women second both days. The games are the final ones in North Atlantic Conference play for both UMPI teams. They finish up with home games against UM-Fort Kent Feb. 12. The Owl women (7-15 overall, 2-10 in the NAC) have lost four consecutive games and the men (9-13 overall, 3-9 in conference) have dropped three in succession following home losses to Maine Maritime Academy Tuesday. Coach Gavin Kane and his women’s team, which had upset MMA in Castine on Jan. 19 by a score of 57-53, lost at Wieden Gymnasium in the most recent meeting, 54-33. The game was tied at 9-9 after one quarter and UMPI used two free throws by Hunter Mercier to take a 13-11 edge with 7:25 left in the second, but Morgan Boudreau of MMA drained a 3-pointer midway through the period and the Mariners never trailed again. Alayne Felix put in 16 points and hauled in eight rebounds to lead MMA in scoring, while Sara Musselman had nine points and Mercier added seven for UMPI, which shot only 20 percent from the floor in the contest. The Owl men were locked in a close game with the Mariners throughout. Down by eight points with 3:28 to play, UMPI stormed back and cut the margin to one on a Shyquinn Dix 3-pointer with 20 seconds to play. Two free throws by MMA’s Andrew Liebert stretched the lead to three before UMPI came up empty on its final possession in the 70-67 Owl loss. Griffin Guerrette was the leading scorer for UMPI with 21 points. He made 8 of 11 field goal attempts and was 3 for 3 from the foul line. Dix scored 16 points and also had five assists and four rebounds, while Will Griffiths had 12 points. Te’Von Hines led the Owls in rebounds with 12 and also netted nine points. Adam Richardson scored 23 points for the Mariners.